One, two, three … are cardinal numbers. First, second, third … are ordinal numbers. Ordinal numbers normally show the order or sequence of something or someone. You can normally create ordinal numbers by adding -TH to the end of a cardinal number. The main exceptions are with the numbers 1, 2, and 3. When do we use ordinal numbers? We use ordinal numbers when giving a date. We use ordinal numbers when we want to show the order or position of someone or something in a sequence. Woodward United finished second in the league last year. I came third in the race. This is the first time it has happened. Our office is on the ninth floor. A person’s 15th birthday is an important celebration in Mexico. He had a huge party for his twenty-first birthday. Shakespeare was born in the 16th century. The Renaissance was a period in European history from the 14th to the 17th century. For the name of a king or queen in written English, Roman numerals are used. However those Roman numerals are said as an ordinal number in spoken English. Louis XVI (Louis the Sixteenth) was the last king of France before the fall of the monarchy during the French Revolution. 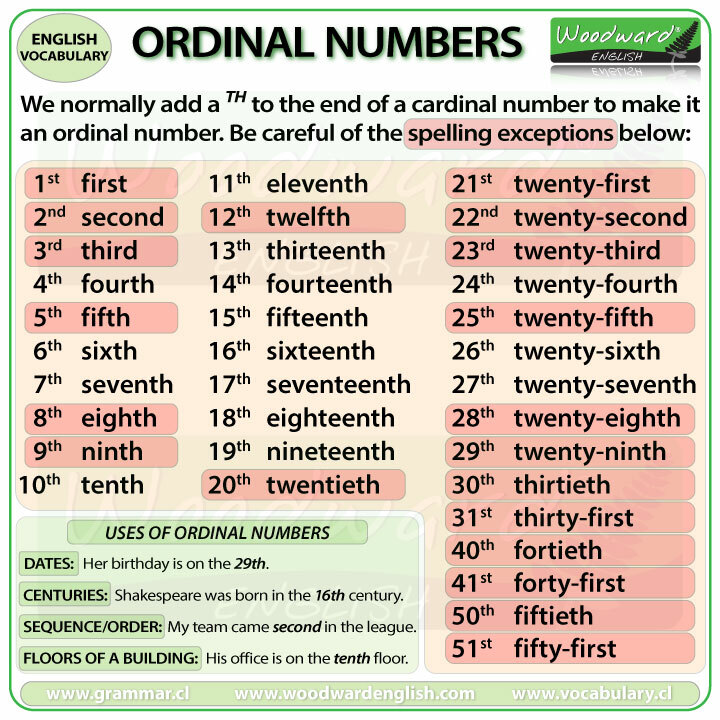 We have included all of the ordinal numbers from 1st to 31st because they are needed when you give a date in English.